Sports nutrition is no longer exclusively the domain of professional athletes and weightlifters. Global events, urban marathons and cross-country events, have thrown sports into the spotlight and rising interest in fitness and body image has led to specialist brands being repositioned on a healthy living platform. With the mainstreaming of the sector expected to continue over the next few years, consumers with a casual fitness lifestyle now outnumber professional athletes and more space on retail shelves is devoted to such products. This gives sport supplements manufacturers the opportunity to market to a vast and varied audience. As a global leader in delivering high-quality, innovative dosage forms and solutions, Capsugel brings the answers you need to achieve commercial success. For the past decade, we have been working to overcome the most complex marketing and formulation challenges associated with dosage form consumer preference and product development. Hermetically sealed Licaps® capsules are - leak-proof, airtight, one-piece capsules with superior odor protection and outstanding product integrity. This technology is specifically well adapted to challenging compounds such as phospholipid-rich extracts like Krill Oil and hygroscopic ingredients like carnitine. 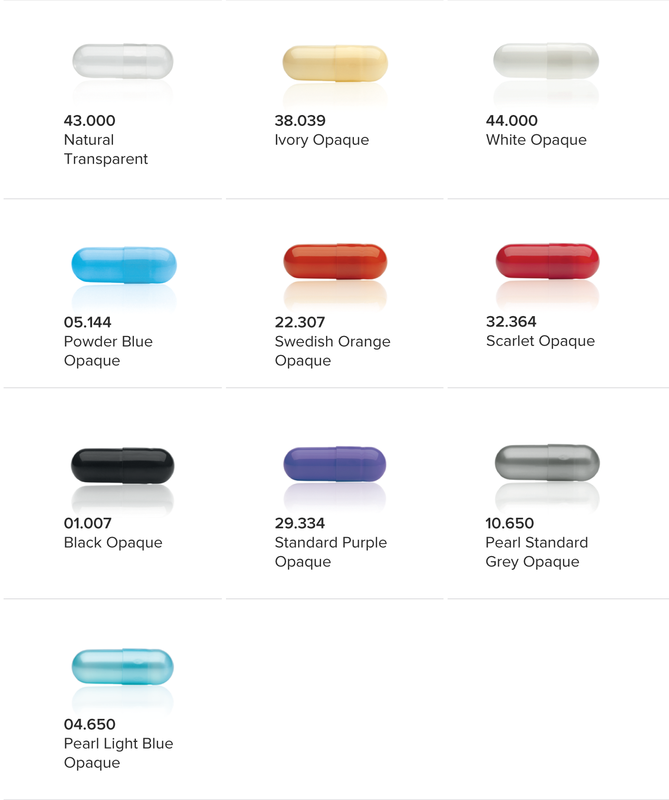 Capsugel’s Licaps® capsules are ideally suited for stable and secure containment of better bioavailable free forms of active materials rather than their salt or oxidized forms (designed for tableting and powder encapsulation), including ingredients such as beta-hydroxy-beta-methylbutyric acid, L-carnitine base, and ubiquinol. Discover how to increase dosage with Capsugel’s DRcaps™ Big Sized Capsules (#000), designed to provide accurate doses and help protect from stomach acid, as needed for creatine, that require a high dosage to carry an EFSA health claim. Capsugel’s LMP (Lipid Multiparticulate) technology encapsulates ingredients in small spherical lipid particulates, which can be used in applications such as ready-to-mix blends to taste mask bitter ingredients, such as theacrine and caffeine or to extend release times, as needed for pre- and intra-work out supplements. Conquer difficult product combinations, with Capsugel’s DUOCAP® capsule-in-capsule technology which enables the combination of liquid and solid actives for different release profiles, or improved stability such as vitamin K2 and calcium, or omega 3 and multi-mineral combinations. Probiotics can be combined with prebiotics to be protected from humidity in DUOCAP® capsule technology. In addition to their digestive benefits, probiotics have their place in sports nutrition and help improve post workout muscle recovery. 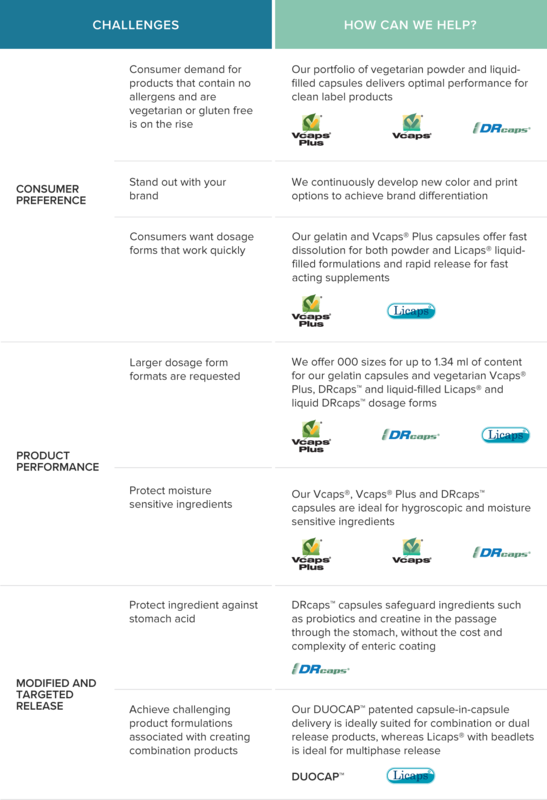 No matter what your formulation challenge, Capsugel has a solution to suit your product’s needs. Click the table below to learn more how we can help to meet your technical or marketing goals. Having challenges developing sports nutrition products? Want to learn more about our latest product concepts for sports nutrition?